Mr. Darcy (JJ Gatesman), Miss Bingley (Genevieve Breitbach) and Mr. Bingley (Matthew Collie) play a game while listening in on a conversation in a scene from Summerstage's "Pride and Prejudice." It is a golden opportunity for the Bennet family in “Pride and Prejudice,” a play based on Jane Austen’s 1813 novel, when an eligible, wealthy bachelor moves next door. The Bennets have five daughters of marriageable age and Mrs. Bennet in particular is anxious to see her daughters wed.
SummerStage is presenting “Pride and Prejudice,” directed by Brian Zelinski, continuing a series of plays with characters struggling with the truth. 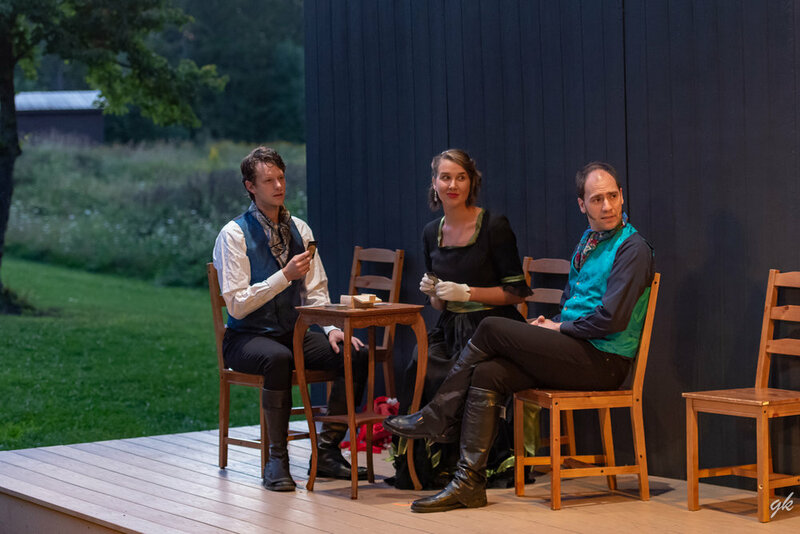 The cast includes several holdovers from the successful presentation of “Tartuffe,” which opened the season, and they, along with the rest of the cast, enjoy another fine turn on the outdoor stage. At the gala, the oldest Bennet girl, Jane (Deanna Strasse), is attracted to Bingley (Matthew Collie) and returns to his estate for a visit in the rain and becomes ill. Her sister, Elizabeth (Victoria Hudziak), tromps through the mud several miles to care for her and meets the arrogant Darcy, a friend of Bingley’s, and the marvelous, heated exchanges between him and Elizabeth are full steam ahead. “Your defect is a propensity to hate everyone,” she tells Darcy. “And yours is to willfully misunderstand them,” he replies. This has been the stuff of movies for decades – the relationship that starts off very badly and ends up … well, you can probably guess. Oh, but like any good Victorian soap opera, there’s lots more going on here with the girls and their guys. You need a scorecard to keep track of all of them. There’s Mr. Collins (Jim Mallmann), a clergyman who is in line to inherit the Bennet estate. He has his cap set for Elizabeth, but she flatly refuses and instead he marries Charlotte (Paige Bourne), a friend of Elizabeth’s. Meanwhile, the Bennet girls learn of the soldiers stationed nearby – fertile ground for finding a husband. Elizabeth and one soldier, George Wickham (Zachary Klahn), embark on what looks like a promising relationship. But a letter from Darcy reveals he’s not such a good catch. Wickham ends up with another Bennet girl, Lydia (Mary Jensik) –long story – while Elizabeth keeps running into Darcy and unfortunately, his high-minded aunt, Lady Catherine (Rebecca Richards), who minces no words in showing her disdain her disdain for Elizabeth. Yet, Darcy is intrigued by the fiery Elizabeth, who tells his aunt that she will not refuse his proposal of marriage. Back to the beginning with Bingley and Jane. Let’s just say, it’s a happy ending. Austen is the ultimate romantic, and this cast nicely captures the highs and lows of budding relationships, starting with Hudziak and Gatesman. Hudziak has a whole tool box of acting skills, including well-placed pauses, gestures and expressions that make her such a delight to watch here, just as was her Doreen in “Tartuffe.” Gatesman is a good match for her, helping to make the evolving romance believable. Several other performances here were uniformly good, including accents that, though somewhat uneven, reflected mostly a high society tone. I really enjoyed Bourne’s Lydia, with her ample, puffed up arrangement of golden locks. Lydia struts and moves with purpose, reaching high levels of energy and enthusiasm that reached the back rows of a large Thursday night crowd. As her spouse, William Molitor is nicely low key to make the contrast with his wife even greater. I loved the way he deadpans to his wife when she complains that he doesn’t understand her anxiety. “I have the highest respect for your nerves. They are my old friends,” he tells her. Strasse’s Jane, as well as Collie’s Bingley, have suitable airs and carriage for their roles, while Mallmann delivers another well-done performance as the pompous parson. It is quite delicious to see him deflate when Elizabeth refuses his proposal. Richards plays one of literature’s oft-appearing characters – the evil aunt – to perfection, as she does in most any role she takes on. Genevieve Breitbach and John Gelshenen also do well in their dual roles, while Gwynyth Martin gives her small role as the housekeeper lots of life. Zelinski has chosen virtually propless, charcoal monotone backdrops for this production. Characters often sit on plain straight back chairs – like classroom chairs -- lined up toward the back of the stage. The three younger daughters – Lydia, Mary and Kitty (Denke Havey) – are usually stage right, while Elizabeth and Jane are usually stage left. While SummerStage offers challenges in creating an elaborate set, I really missed seeing some semblance of the well-appointed Bennet home and other settings to help the audience place the characters. While Austen’s repartee is wonderful – and these performers handled it well – the performers on stage sometimes had the appearance of being at a high school speech contest. The lack of set pieces also gave the performers little to do while speaking or listening, which bogged down the show in some places. On the other hand, moving pieces about, when not handled well, can also slow the pace. Also, some characters at the edges of the stage found themselves in shadows at points, while those roaming in garden scenes meandered off the stage and sometimes out of view of the audience. Yet, this is a fine cast which, with its performances, has done justice to the queen of Victorian romance.